Tiramisu is basically an Italian dessert with coffee and liquor-soaked layers of sponge cake alternating with mascarpone cheese and chocolate. This dessert is appreciated by people because of its groovy and fabulous taste. 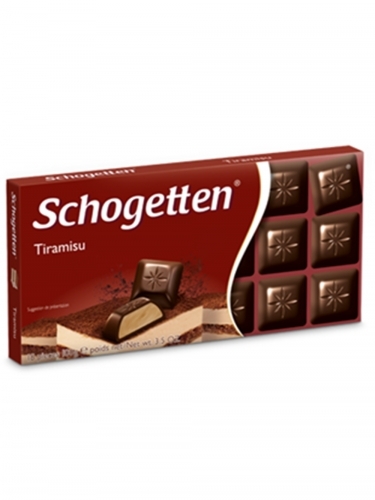 Schogetten, a famous German brand came up with the combination of Tiramisu and dark chocolate. Tiramisu chocolate is basically a dark chocolate filled up with Tiramisu to give people an appetizing taste. It fills one’s mouth with thick creamy savory taste and is in great demand among people of different age groups. One should try it anyway to drown oneself in its rich and colorful taste. We are here to help you as this chocolate is not found easily in Indian stores. With Foodfeasta.com, you can order it online and enjoy. We would be happy to help you.